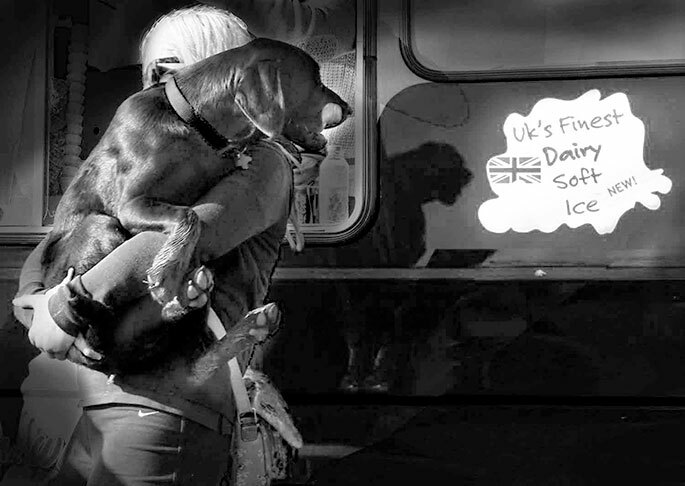 Happy to post that 'UK's finest' was shortlisted ( October 2018) for the Suschitzky Photography Prize'! although I did not win the prize, I was delighted to know that I made the final shortlist. Recently commissioned by the Jewish museum to film and edit a time-lapse video, of the installation of the commissioned art piece 'Love Is A Losing Game' by street artist Pegasus, which is now showing on the Jewish museum's website. This year I am exhibiting my photography in the Artists Open Houses festival in Brighton, as part of the Brighton festival. Over four weekends in May, artists open their doors to offer work from over 1,200 artists, exhibiting in more than 180 venues across the city of Brighton and Hove. I will be there with my work each weekend at 22 Cornwall Gardens. My image "From dog to man and from man to dog again." has been commended in the Street Photography category of the 2017 Sony World Photography Awards. The image was chosen as one of the best 50 pictures in this category. It was selected from 110,00 images from 182 countries. Battersea Power station Ltd purchased my image "Where the water meets the sky" earlier this year and are including it in their display at Battersea Power station access road Art Gallery this Feb 2017.